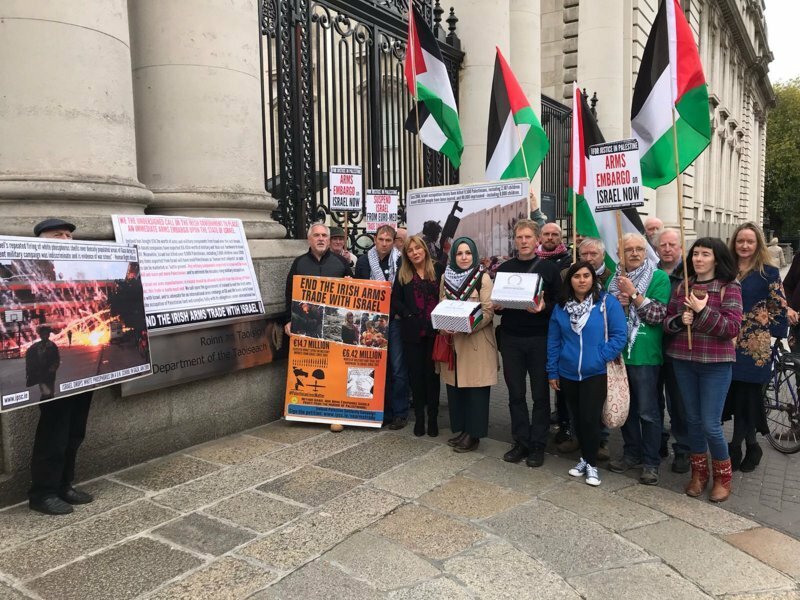 On Wednesday 4th October, the Ireland-Palestine Solidarity Campaign (IPSC) delivered a 23,000-strong petition to the Irish government, demanding an end to the bilateral arms trade between Ireland and Israel. This trade has seen the Irish state buy some €16.6m in Israeli-made military items for the Defence Forces since 2005, while companies based in the Republic have exported around €6.5m worth of military components and so-called ‘dual use’ hardware to Israel over the past 6 years alone.The international arms trade is controversial in itself; after all it’s basically a race to develop more efficient and cost-effective means of killing other human beings. However, Ireland’s arms deals with Israel should make everyone sit up and take notice. Israel is a colonial state literally built upon the forced expulsion of hundreds of thousands of Palestinians from their homeland in 1948, that for fifty years has been responsible for one of the longest and most brutal military occupations in modern history, and which has imprisoned two million people under a cruel and illegal siege in Gaza for the past decade. It is a state that, according to the UN and international human rights organisations, is responsible for the commission of war crimes, continuous international law violations and severe human rights abuses. It is a state that, a report commissioned by the UN last May found, oversees “an apartheid regime that oppresses and dominates the Palestinian people as a whole”. It is a state which, since the outbreak of the Second Intifada in 2000, has killed over 9,500 Palestinians, the vast majority of them civilians, including more than 2,000 children. Furthermore, it is a state that has exported weapons, tech and training to governments responsible for repression of ‘troublesome’ populations and regimes and groups accused of genocide and other horrendous war crimes. Many military items exported from Israel will have used Palestinians as ‘test subjects’, allowing such weapons to be marketed as ‘battle-tested’. According to the Irish government, some of the items purchased from Israel include “small arms ammunition”, “an artillery fire control system”, “unmanned aerial vehicles”, “a surveillance and target acquisition suite for light tactical armoured vehicles” and “ground surveillance radars”. Such sterile language masks the horrific reality that these bullets, drones, targeting devices and other military items have been used – ‘battle-tested’ – to viciously attack and oppress the people of Palestine. Meanwhile, any military components exported to Israel will undoubtedly be used to kill and maim yet more Palestinians, and to entrench the decades-long military occupation by destroying Palestinian lives and livelihoods. By engaging in this trade, Ireland has played a role in enabling these, and many other, crimes against the people of Palestine – something which should be unconscionable for a state that claims “respect for and the promotion of human rights” to be “a cornerstone of foreign policy”. Yet the response from the Irish government has been extremely disappointing. Confronted numerous times by opposition politicians over the past few years, the government has repeated the same inadequate stock responses. Safeguarding regional stability and human rights? The irony would be funny were it not so sickening. When it comes to purchases (most recently the spending of a further €1.9m of taxpayer money on Israel-made drones) mantras about ‘value for money’, ‘protecting Irish troops’, ‘dealing impartially with all tendering companies’ are trotted out. Sir Humphrey would, no doubt, be proud of this amoral, circular, civil service logic; in short, we are being told that because the neither EU nor Ireland has imposed an arms embargo on Israel, there can therefore be no arms embargo – not even a silent one – placed upon Israel. Merely repeating the fact that there is currently no EU arms embargo in place upon Israel – a state surely deserving of such an embargo given it’s repeated commission of war crimes – would appear to be a moral cop out to abdicate responsibility for a certain degree of complicity in the oppression of Palestinians arising from this trade. And of course, the demand from the campaign to end the Irish arms trade with Israel is precisely to impose an arms embargo! Naturally, no one wants to see Irish troops placed in harm’s way as a result of substandard equipment – but there are of course other avenues from which essential military items of a high standard can be procured. Price alone should surely not be the deciding factor in deciding where to purchase goods from. There should be a high moral, ethical and human rights dimension applied. Even if this means digging a fraction deeper into the public purse, it would be a tiny price to pay for ensuring that Ireland is not subsidising and giving succour to the Israel war machine. This call for an Irish arms embargo on Israel is one supported not just by the IPSC and the 23,000 people who signed our petition; public figures, NGOs, trade unions, political parties, and scores of elected representatives all support the campaign. Internationally, noted supporters of an arms embargo on Israel include Nobel Peace Laureates Archbishop Emeritus Desmond Tutu, Adolfo Peres Esquivel, Jody Williams, Mairead Maguire, Rigoberta Menchú and Betty Williams; intellectuals and academics such as Noam Chomsky, Rashid Khalidi, Judith Butler, Ilan Pappé, and David Palumbo-Liu; artists such as authors Alice Walker and Michael Ondaatje, musicians Roger Waters, Brian Eno, and Boots Riley, and filmmakers Mira Nair, Mike Leigh, Ken Loach, and John Pilger. An arms embargo against Israel is also called for by human rights organizations such as Amnesty International and War on Want. Kevin Squires is National Coordinator of the Ireland-Palestine Solidarity Campaign. Check out the IPSC’s upcoming events page for talks, film screenings and actions taking place near you.